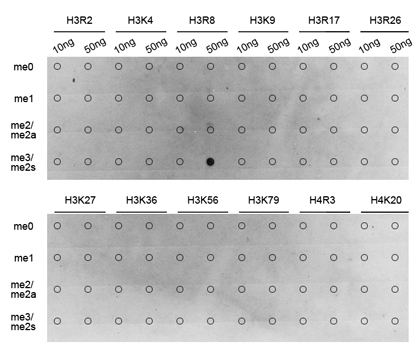 Western blot analysis of extracts of HeLa cell line and H3 protein expressed in E.coli., using Histone H3R8 Asymmetric Dimethyl Polyclonal Antibody. Dot-blot analysis of all sorts of methylation peptides using Histone H3R8 Asymmetric Dimethyl Polyclonal Antibody. Immunofluorescence analysis of 293T cell using Histone H3R8 Asymmetric Dimethyl Polyclonal Antibody. Blue: DAPI for nuclear staining. Histone H3R8 Dimethyl Asymmetric (H3R8me2a) Polyclonal Antibody. Unconjugated. Raised in: Rabbit. I used the antibody to determine the effect of PRMT5 knock down on global gene regulation in mantle cell lymphoma cells. We monitored symmetric dimethylation of histone H3R8 via Western blotting. specificity was good. price was reasonable. What are the cons of the product? - nothing really.